To our knowledge this CellML model is an accurate translation of the published model however it does not replicate the published results. The model runs in both OpenCell and COR and the units are consistent. The only information missing from the published paper was the initial values for the gates. These have been set to 0.1 for model completeness but it may be these values which are causing the model to break. ABSTRACT: In this paper we consider a model for the phenomenon of bursting in nerve cells. Experimental evidence indicates that this phenomenon is due to the interaction of multiple conductances with very different kinetics, and the model incorporates this evidence. As a parameter is varied the model undergoes a transition between two oscillatory waveforms; a corresponding transition is observed experimentally. After establishing the periodicity of the subcritical oscillatory solution, the nature of the transition is studied. It is found to be a resonance bifurcation, with the solution branching at the critical point to another periodic solution of the same period. Using this result a comparison is made between the model and experimental observations. The model is found to predict and allow an interpretation of these observations. A schematic representation of the transmebrane ionic currents described by the Plant 1981 model of a bursting neuron. 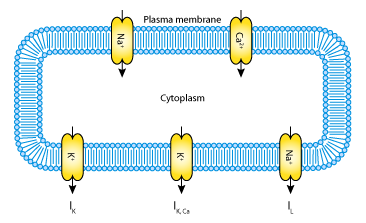 The model includes a voltage dependent sodium current, II; a slowly activating calcium current, ICa; a voltage gated potassium current, IK; a calcium activated potassium current, IK,Ca; and a leak current, IL. Derived from workspace Plant, 1981 at changeset 642a41eb107d.